If you want to recapture the essence of a classic movie in a new version, I guess a shot-for-shot remake is one approach. 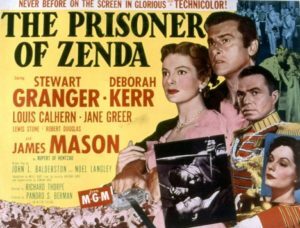 The 1952 Zenda used the same shooting script as the 1937 version with just a few changes, and even a cursory comparison shows that scenes, set-ups, and shooting angles are virtually the same in both. They even repurposed Alfred Newman’s excellent score from the earlier film. But though the newer version is just as well made as its predecessor, it lacks some of the spark or spirit of the Ronald Colman film. Why is that? The qualities of the ’37 version certainly weren’t the result of spontaneity or serendipity—it was shot, cut, re-shot, and re-cut until the studio finally had what they wanted. And Zenda already had a long history on the stage, and even on film, with two previous silent versions. Perhaps it was that the ’37 version aspired to be better than what had gone before, while the ’52 version only aimed to be as good—and that just wasn’t aiming high enough. The story is still great, and there’s no denying that Ruritania and its comic-opera uniforms look better in Technicolor, even if we miss James Wong Howe’s dueling shadows. But a Zenda stands or falls on its hero, the twin cousin Rudolfs, and their nemesis, Rupert of Hentzau. The ’37 version had the mature Ronald Colman as Rudolf playing off the brash young Douglas Fairbanks, Jr. as Hentzau. The new ’52 flips this, pitting the energetic young Stewart Granger as Rudolf against the seasoned and sophisticated James Mason as Hentzau—and yes, it works. Granger is confident and likeable, and lithe enough for some acrobatic swashbuckling. Furthermore, like Basil Rathbone and Cornel Wilde, he’s a serious fencer: Mason had to be doubled by an expert in the final, heart-stopping saber duel in Zenda Castle, but that’s Granger all the way. Put a sword in Granger’s hand, and Colman is eclipsed. Ah, but when it comes to the love story, the sly and nuanced Colman easily outdoes the new guy. However, Deborah Kerr as the new Princess Flavia holds her own compared to Madeleine Carroll, and maybe even edges her out. As for the rest of the supporting cast—Louis Calhern, Robert Douglas, et al.—they all carry their weight, but can they compare with Raymond Massey, David Niven, and C. Aubrey Smith? Sorry—there the ’37 entry gets the nod. That said, the Granger version is still top-notch entertainment, and who doesn’t want to pop a monocle over his eye and spend another two hours in Ruritania? Bonus: watch for craggy old Lewis Stone playing the Cardinal of Strelsau—Stone, the man who starred as the twin Rudolfs in the silent 1922 version!